Halloween has always been my favorite holiday. I love the creativity and elaborate costumes people create. Maybe I also loved the chance to become someone else. Someone not the everyday me. Sort of like the reason I used to drink. I am excited for my first sober Halloween. I am going as Gizmo from the Gremlins. I am going to a parade and party where I don’t know anyone. Normally, this would have made me nervous and I would get drunk to loosen up and fit in. But I like that I get to introduce myself as a sober person. These people do not know the drunk, party girl I used to be. For this Halloween, I get to be a new me for new friends. Previous Halloweens, I would put a lot of work into a costume. Then I would get trashed and not remember how the night ended. Tonight I will get to fully enjoy the holiday. I look forward to seeing the talented creations tonight. I will post some mistakes from past Halloweens later. Need to start getting my costume ready! 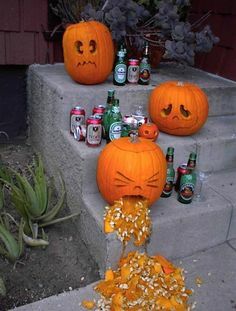 Ah, drunken past Halloweens and November 1 hangovers. Won’t miss either of those this year!